There are 11 mooring balls to choose from on Elbow reef. Balls E1 and E11 are out side of the sanctuary preservation area all others are inside the protection of the sanctuary. The ball numbering runs south to north with the highest number to the north. Elbow reef has had many ships run up on the reef with over 15 documented. Some of these wrecks were surveyed and documented by Divers With A Purpose and specifically concentrated on Hannah M Bell. Click here for an in depth report of the survey and map of the wreck. Check out the latest Google satellite image of Elbow reef and you can see both Hannah M Bell and City of Washington wrecks! This ball will get you into the beautiful sand channels and also give you access to the Hannah M Bell. At the bottom of the mooring ball head north and you will go over 2 reef lines and should be able to see the wreck, look for the cutwater spa sticking up by the reef line. The wreck then runs out to the north. when you have travelled up and down the wreck take the opportunity to go up and down the sand channels as you travel back to the boat as you will often see nurse sharks and lots of Spiny Lobster. Hannah M Bell or locally known as Mikes wreck. The Hanna M Bell was built in England in 1893 and named after the woman who christened her. The 315 foot steel hulled steamship carried cargo between US East Coast ports, Caribbean and Mexico. On route to Vera Cruz in Mexico she struck the reef on 4 April 1911. She spent a number of days stuck on the reef when the decision was made to salvage her. 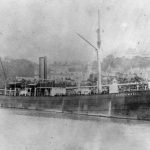 She was heavily salvaged both legally and illegally leaving just the 300 foot superstructure. The mooring ball is on top of a rock outcrop slightly north of the wreck. When you reach the bottom of the mooring line you will see a channel. Go south from here down the channel for 20 feet you will come to the start of mikes wreck. This is a great wreck in around 25 feet of water. Stay on the wreck until you reach the end. You will see the reef line rise up in front of you on the other side is another sand channel. Turn around here and travel back down the wreck you will end up by the sand channel where the boat is moored. If you have enough air you can go past the entrance and into the next larger sand channel. 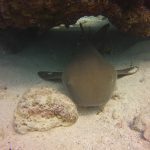 This is a great addition to the dive and has many lobsters hiding in the rock formations and occasionally a nurse shark or two. Dependent on how the dive boat is lying you will often find it is above this channel. At the very end of this channel is a cannon. This is the south end of the Hanna M Bell. You will be moored over the sand channel that lies parallel to the channel at the end of the Hannah M Bell. To get to the Hannah M Bell you will need to set your compass for the ball E7 whilst you are on the boat or from the bottom of the mooring line travel south. It takes 5-10 mins to get across the to the start of the wreck. You will pass over 2 large sand channels, when you see a large tube on the sea bed (its about a foot in diameter and 10 foot long) you will nearly be at the wreck. Swim over the large tube and bear right and you will get onto the wreck. You can then do the same dive as described for E7. When you get back to the large tube follow your reciprocal bearing back to E8. City of Washington (South end). The mooring ball is attached to the top of the reef formation. Depths here are 25 feet and visibility is typically over 40 feet. Dive this site by starting at the bottom of the mooring line. By traveling north you will dive along the wreck of the city by staying on the wreck you will not get lost. At the end of the wreck you will see the sand area and the mooring line for ball 10. Turn around here and return back to the mooring line you started from. If you have sufficient air its worth exploring the reef around here and we often see southern sting rays, nurse sharks, turtles and many large lobsters. Remember that you are in the sanctuary here and should not touch any wildlife! The north end of the City of Washington. The dive for this ball is the opposite to ball 9.